The Ace Moving Company proudly advertises the fact that their delivery service is fast and courteous. The crew of STS-5 poses for the first "star-burst" crew photo, now familiar on most Shuttle missions. 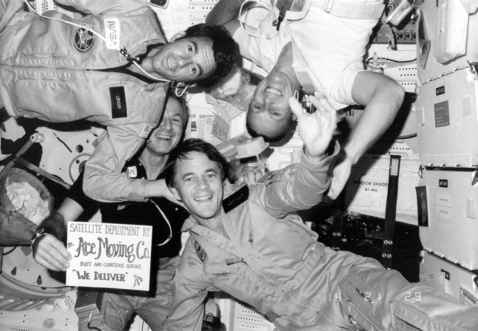 Commander Brand holds the sign, with Lenoir and Allen in flight suits and Overmyer in a T-shirt. 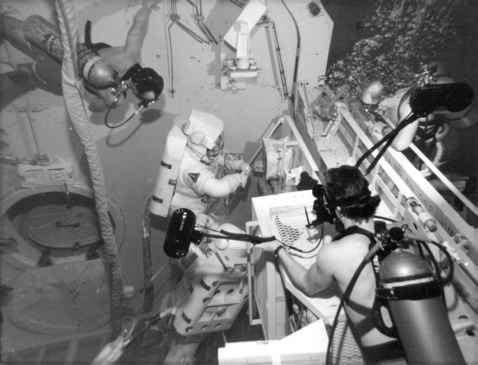 Allen and Lenoir, supported by Scuba divers, practice their planned EVA activities in the Weightless Training Facility (WETF) at JSC. Both suits are pressurised and weighted down to simulate the microgravity conditions of space. mission specialist, or MS 1) and Lenoir (as MS 2) joining Vance Brand and Bob Overmyer on STS-5. Story Musgrave and Don Peterson were in training for STS-6, alongside Paul Weitz and Karol Bobko.8 Back-up crews would no longer be assigned to STS missions, as there was now a pool of experienced Shuttle pilots from which to draw and any crew member could be replaced with minimal impact to crew training and scheduling. Crews would still continue to provide support roles on like-for-like missions for some time, however. In March 1982, STS-3 flew a near-perfect mission, further testing the robotic arm (by lifting a diagnostics package out of the payload bay for the first time) and carrying an expanded payload of science and engineering experiments. Three months later, STS-4 completed the OFT programme with a textbook mission, which was partially classified due to the DoD payload it carried. When it landed on 4 July, America celebrated the inauguration of its Shuttle programme to operational flight status. The Shuttle had proven it could fly, operate in orbit, return and fly again. Now it was time to see what work it could really do. When Joe Allen was told he would fly on STS-5, he was absolutely thrilled. It was too early for the 1978 selection to be assigned to a flight (although they were being considered for STS-7 and STS-8), so the choice of mission specialists for the first operational flight came from the 1967 selection. The remaining two 1965 scientist-astronauts were Garriott (already assigned to Spacelab 1) and Kerwin. At one time, Kerwin had been considered for assignment to STS-13, but he had become the NASA representative in Australia in April and was out of consideration for crew assignment. Allen thought the selection would go alphabetically because he and Lenoir were assigned to STS-5 (Parker was working on Spacelab 1, Henize and England were already working on Spacelab 2 and Thornton, according to some reports, on Spacelab 3 issues). Lenoir, however, thought his selection to the crew was based on the back-up work he had performed on Skylab (along with that of Musgrave who was assigned to STS-6).9 In addition, he assumed that his experiences in simulators for Skylab (as he put it, "tested under fire'') revealed how he would probably respond and behave on an actual space flight. But, as with Gemini and Apollo, the mysteries of crew assignment remained just that - a mystery. Once Lenoir came off Skylab, he had been assigned by Jack Schmitt, then Assistant Administrator for Energy Programmes at NASA, to lead a NASA team of eight people studying the potential and economics of space orbiting power systems, an assignment which lasted from 1974 to 1976. In 1976, Deke Slayton announced the crews for the Approach and Landing Tests (flown in 1977) and in 1978, the names of the four Orbital Flight Test crews for the initial test flights of the Shuttle programme. Flights one to four would be two-person crews, but flights five and six were expected to be four-person crews, including the first mission specialists. 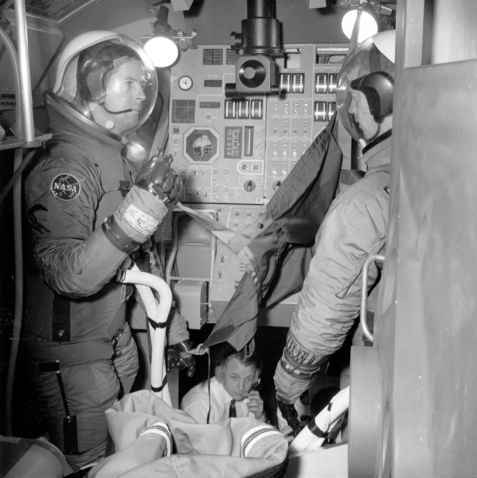 It was the first opportunity for Lenoir (and the other scientist-astronauts not assigned to Spacelab development) to be considered for a flight seat.